From mountain highlands to forests to savannas to sub-Antarctic tundra on Prince Edward Island, South Africa is a truly biodiverse nation. 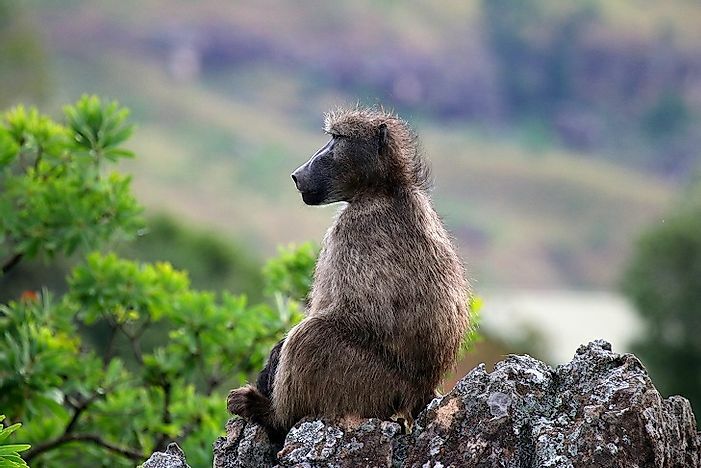 A baboon sits upon a rock in the Drakensberg alti-montane grasslands and woodlands. From mountain highlands to forests to savannas to the sub-Antarctic tundra on Prince Edward Island, South Africa is a truly diverse place. It is bordered by six countries and by the Indian and Atlantic Oceans. Its climate is as varied as its biomes from temperate to desert to subtropical weather. Flora and fauna are among the most biologically diverse in the world with high endemism. The Agulhas Bank has one of the most diverse marine biomes on the coast of the African continent, spanning 160 miles in length between the Atlantic and Indian Ocean shores. The area is known for its dangerous navigation conditions. Fishing in the region is plentiful with the most diverse marine life. A recent taxonomic research yielded a count of at least 12,914 marine species. Corals, cetaceans, fur seals, birds, fish, and crustaceans abound with sardines and anchovies. Sports fishing, fisheries, and subsistence fishing all pose a threat to conservation efforts. Although the Albany thickets are not as biodiverse as some parts of the country, they contain Mediterranean forests, woodlands, and scrub in the eastern portion of South Africa. Dense stands of trees explains the name of this ecoregion. Valleys have cooler climate than the hot inland areas. Succulents abound with creepers and thorny shrubs. Fauna consists of rhinos, elephants, antelopes, kudus, hartebeests, and other ungulates with birds such as orioles, sunbirds, and siskins sharing the habitats. Overgrazing and agricultural land clearing present conservation problems. The southern temperate freshwater biome is found in the Amatole-Winterberg Highlands where fly-fishing is a popular tourist activity in the area's rivers. It is a series of high altitude areas where rivers and streams support amphibians, reptiles, and mammals. Climate is temperate due to the high altitude location. Conservation issues range from habitat destruction to degradation of forest lands. Introduction of non-native trees and fish species are also a threat to the native species. Further threats are introduced trees giving rise to high rates of evapotranspiration that have lowered water levels. Bass and trout have also preyed on native fish lessening their numbers. The Cape Fold ecoregion contains southern temperate freshwater biomes such as rivers and streams that have outlets in the Atlantic and Indian Oceans. Its fish biota are largely comprised of high levels of endemism among species. Flora consists of reeds, lilies, and small water flowers (Aponogeton distachyos), while fauna is comprised of native and non-native commercial fish such as trout and bass. Several species of amphibians, snails, arthropods, and insects also share this biome. Mediterranean weather dominates the higher altitude regions while coastal climate is dominated by winter rains. Land cultivation and dams pose a threat to the ecological balance and fish habitats. The Drakensberg alti-montane grasslands and woodlands consist of montane grasslands and shrublands in southern Africa. The country's highest peak, the Drakensberg, and its longest river, the Orange River, are both found here. Snow is present in winter and climate is cool and wet in the high montane biomes. Flora includes grasses, shrubs, and creeping plants. Grasslands are dominated by conifers. Fauna consists of around 299 avian species. Reedbucks, Klipspriners, and elands roam the forests. Baboons, chameleons, and Oribis also share the habitats. Conservation issues range from overgrazing to land clearing for agriculture. The Kalahari xeric savanna has deserts and xeric shrublands with a semi-arid climate. Its range covers the northwest of South Africa to Botswana and Namibia. Precipitation is irregular in the form of summer storms. Night temperatures dip while day temperatures rise to the 45° Celsius. Flora consists of Acacias, shrubs, bushes, and reeds. Birds, ungulates, and mammals roam the area such as gazelles, cheetah, leopard, hyenas, weavers, eagles, owls, and lions. Conservation concerns range from tourism, fences, and cattle grazing to habitat alteration. Poisoned baits to eliminate some wild predatory animals to protect livestock. Several species are in the endangered species list.